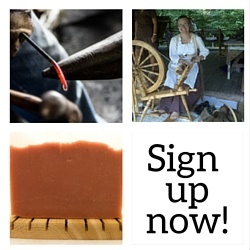 We offer a variety of classes and workshops on topics such as blacksmithing, spinning, felting, soap making, and more. Classes are held here on our working farm, giving you the unique chance to learn traditional skills and techniques in an authentic farm setting. We offer classes on a rolling basis so not all of the classes below will be scheduled for upcoming months. Please contact us if you’d like to set up a private or group class for any of the classes below if you don’t see them under “Upcoming Classes”. Our beginners blacksmithing class gives you a basic history of blacksmithing and introduces you to the tools of the trade. You’ll learn basic techniques such as drawing out, twisting, cutting, and shaping. Each beginning student will work on 2 or 3 pieces during the class usually a decorative hook or similar item that they finish and take home. All materials, supplies, and tools are included in the class fee. Class fee: $50 per student. Maximum number of students is 4. This class will focus on splitting and shaping techniques. Students will forge a fire poker and a heart hook. All materials and tools are furnished. This class will focus on decorative functional items. Students will learn to make leaves, rams head items, and candle holders. Maximum number of students is 3. In this class we start with a discussion of spinning in general: the tools used, the different types of fiber that can be spun and different fiber preparations (e.g. roving, top, sliver). 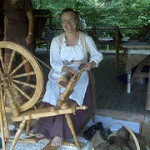 We will then go on to spindle spinning and using a drop spindle, learn how to draft and spin. After spinning enough yarn to get the hang of it, we will move to the spinning wheel. Each participant will spin and ply a small amount of yarn, ending up with a small amount of finished yarn. Included in the class fee is a drop spindle and 4 ounces of several kinds of wool that the participant can take home. Spinning wheels are available for participants to use at no cost. Children must be at least 10 and preferably 12. In our Intermediate Spinning workshop we discuss wool and wool preparation,the different types of spinning, hand carding techniques, plying techniques how to finish your yarn. Participants should be able to spin, even if it is just as a beginner. The workshop will be tailored to the participants can be a follow-up after the beginning workshop, or to just help new spinners move beyond their first skeins. Included will be several types of roving: wool including Shetland, Icelandic, Corriedale; Llama or Alpaca; cotton and blends. Learn to spin. Here’s one of the oldest and simplest ways to make yarn. It is a great way to learn to spin, and spindles are far more affordable, and more portable, than spinning wheels. The class includes two ounces of wool roving, and the chance to play with lots of different spindles. We will practice basic techniques, and explore why some spindles are easier to use than others. All materials provided including 2 oz of wool and drop spindle for you to keep. Maximum number of students is 8 and the minimum to hold a class is 3. Dyeing with plant materials is an ancient art. In this workshop students will learn the basic principles of using natural dyes. Growing and harvesting the plants will be discussed and plant materials harvested in season will be used along with some dried materials. Students will learn the proper use of mordants to and which fiber to use them on. All materials will be included and student will take home a variety of dyed samples. The class will be held outside using propane cookers, so students must be old enough to safely work near the cookers. The process is messy so old clothes are recommend. Students may bring their own yarn or wool to dye with as long as it is mostly wool — no acrylics please. Class length: 3 to 4 hours. Dyeing yarn is often thought to be a mysterious process. In this 1-1 ½ hour workshop, participants will dye a hank of yarn using Wilton’s® Icing Color and a crock pot. This is a safe and fun method of dyeing that does not require separate equipment and is a fun way to learn the principles of dyeing. Children should be at least 6 years old (with adult) and 8 if they will not have an adult buddy. Icing coloring will stain clothing so old clothing or an apron is a good idea. Maximum number of participants is 10 and the minimum to hold a class is 3. Felting is the ancient art of creating sheets of wool used in clothing, rugs and even tents. In this workshop, we will create an 8 by 10 felted wall hanging using both wet felting and needle felting techniques. We will then embellish the art with beads, buttons, lace or stitching to create a 3D hanging. All materials are included. Students must be able to get their hands wet and soapy, do the physical activity (of rolling and agitating to wet felt) and should be old enough to safely use the very sharp felting needles. All materials will be provided and participants will take home a completed hanging. Ever wanted to learn how to needle felt? In this mini workshop, participants will learn the basics of felting by making a little penguin or ladybug. The felting needles are VERY sharp so children should be at least 8 years old (with adult) and 10 if they will not have an adult buddy. All materials will be provided and participants will take home a completed little creature. Learn the art of soap making on our working farm, with students making their very own batch of cold-process soap. All materials are included in the class fee and students get a 1 lb. silicone soap mold that is theirs to keep, which they’ll use to make their batch of soap. The focus of the class is on the cold-process method of making soap but we’ll discuss hot-process soap and melt-and-pour soap as well. We’ll learn about the different properties of common oils and other ingredients used in soap making as well as the best places to buy oils, butters, and other ingredients. Each student will also get 20+ page PDF guide that includes all of the details and topics covered in class along with different soap recipes to get started with. Cost: $60 – All oils, lye, fragrances, and colorants used in making soaps during class are included in the class fee. The class fee also includes a 4″ x 4″ soap mold — a great starter mold that holds 1 lb of soap. Our Intermediate Soap Making class takes your soap making skills to the next level, building on what students learned in Intro to Soap Making. While we’ll touch on all the basics again briefly, this class is designed to be more hands-on for students. We’ll make a soap recipe from scratch using SoapCalc and will pick a more advanced project to tackle such as goat milk soap and hot process soaps. We’ll work with a wider variety of vegetable oils and butters including castor oil, shea butter, rice bran oil, palm oil, and palm kernel oil. All materials are included in the class fee and students can use their 1 lb mold from the Intro to Soap Making class or any other mold they have.